Few plants produce blue flowers, and fewer still produce a purer blue flower than this one does. Called Gentian Sage, this tuberous rooted perennial will come back year after year if given some protection from winter cold, or grow as an annual. Growing 45-60 cm. (18-24 in.) 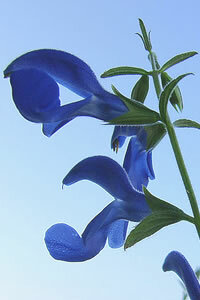 or more in height, the stems will produce loose spikes of sparse pure blue flowers in the mid to late summer. For maximum freshness, please keep seed refrigerated in its original packaging until it is time to plant. Sow seed in containers in a coldframe in spring. Grow on in any moderately fertile, neutral to acid soil with good drainage.